Well, this has been going on for over 6 months now, and I still haven't figured it out. So, I'm curious to know if any one else has encountered something like it. Stable amd64 system, KDE4 desktop (4.14.3:4), xf86-video-ati7.5.0. Graphics card is an HD6450, running three Dell 1920x1200 monitors via Eyefinity. [ 6.152133] [drm] radeon kernel modesetting enabled. [ 6.152347] [drm] initializing kernel modesetting (CAICOS 0x1002:0x6779 0x174B:0xE206). [ 6.152959] [drm] radeon: 1024M of GTT memory ready. [ 6.299508] [drm] PCIE GART of 1024M enabled (table at 0x0000000000274000). [ 6.301066] [drm] Supports vblank timestamp caching Rev 2 (21.10.2013). [ 6.301067] [drm] Driver supports precise vblank timestamp query. [ 6.301098] radeon 0000:01:00.0: radeon: using MSI. [ 6.301122] [drm] radeon: irq initialized. [ 6.495994] [drm] UVD initialized successfully. [ 42.020] (==) Using config directory: "/etc/X11/xorg.conf.d"
[ 42.020] (==) Using system config directory "/usr/share/X11/xorg.conf.d"
[ 42.024] (==) No Layout section. Using the first Screen section. [ 42.024] (==) No screen section available. Using defaults. [ 42.024] (**) | |-->Monitor "<default monitor>"
[ 42.024] (==) No monitor specified for screen "Default Screen Section". [ 42.035] (==) ModulePath set to "/usr/lib64/xorg/modules"
[ 42.035] (II) The server relies on udev to provide the list of input devices. [ 42.037] (II) LoadModule: "glx"
[ 42.058] (II) Module glx: vendor="X.Org Foundation"
[ 42.058] (II) LoadModule: "ati"
[ 42.061] (II) Module ati: vendor="X.Org Foundation"
[ 42.061] (II) LoadModule: "radeon"
[ 42.065] (II) Module radeon: vendor="X.Org Foundation"
[ 42.065] (II) LoadModule: "modesetting"
[ 42.065] (II) Module modesetting: vendor="X.Org Foundation"
[ 42.065] (II) LoadModule: "fbdev"
[ 42.066] (II) Module fbdev: vendor="X.Org Foundation"
[ 42.066] (II) LoadModule: "vesa"
[ 42.066] (II) Module vesa: vendor="X.Org Foundation"
[ 42.072] (II) [KMS] Kernel modesetting enabled. [ 42.072] (II) Loading sub module "fbdevhw"
[ 42.072] (II) LoadModule: "fbdevhw"
[ 42.073] (II) Module fbdevhw: vendor="X.Org Foundation"
[ 42.073] (II) Loading sub module "dri2"
[ 42.073] (II) LoadModule: "dri2"
[ 42.073] (II) Loading sub module "exa"
[ 42.073] (II) LoadModule: "exa"
[ 42.073] (II) Module exa: vendor="X.Org Foundation"
[ 42.272] (II) RADEON(0): Using default gamma of (1.0, 1.0, 1.0) unless otherwise stated. [ 42.272] (II) Loading sub module "fb"
[ 42.272] (II) LoadModule: "fb"
[ 42.273] (II) Module fb: vendor="X.Org Foundation"
[ 42.273] (II) Loading sub module "ramdac"
[ 42.273] (II) LoadModule: "ramdac"
[ 42.273] (II) UnloadModule: "modesetting"
[ 42.273] (II) UnloadModule: "fbdev"
[ 42.273] (II) UnloadSubModule: "fbdevhw"
[ 42.273] (II) UnloadModule: "vesa"
[ 42.274] (II) RADEON(0): [XvMC] Associated with Radeon Textured Video. [ 42.274] (II) RADEON(0): [XvMC] Extension initialized. [ 42.274] (II) RADEON(0): RandR 1.2 enabled, ignore the following RandR disabled message. [ 42.496] (**) Power Button: Applying InputClass "evdev keyboard catchall"
[ 42.496] (**) Power Button: Applying InputClass "joystick-all"
[ 42.496] (II) LoadModule: "evdev"
[ 42.498] (II) Module evdev: vendor="X.Org Foundation"
[ 42.498] (**) evdev: Power Button: Device: "/dev/input/event1"
[ 42.498] (**) Option "config_info" "udev:/sys/devices/LNXSYSTM:00/LNXPWRBN:00/input/input1/event1"
[ 42.498] (**) Option "xkb_rules" "evdev"
[ 42.498] (**) Option "xkb_model" "pc104"
[ 42.498] (**) Option "xkb_layout" "us"
[ 42.510] (**) Power Button: Applying InputClass "evdev keyboard catchall"
[ 42.510] (**) Power Button: Applying InputClass "joystick-all"
[ 42.510] (**) evdev: Power Button: Device: "/dev/input/event0"
[ 42.510] (**) Option "config_info" "udev:/sys/devices/LNXSYSTM:00/LNXSYBUS:00/PNP0C0C:00/input/input0/event0"
[ 42.510] (**) Option "xkb_rules" "evdev"
[ 42.510] (**) Option "xkb_model" "pc104"
[ 42.510] (**) Option "xkb_layout" "us"
[ 42.510] (**) HDA ATI HDMI HDMI/DP,pcm=3: Applying InputClass "joystick-all"
[ 42.510] (II) No input driver specified, ignoring this device. [ 42.510] (II) This device may have been added with another device file. [ 42.511] (**) HDA Intel PCH HDMI/DP,pcm=3: Applying InputClass "joystick-all"
[ 42.511] (II) No input driver specified, ignoring this device. [ 42.511] (II) This device may have been added with another device file. [ 42.511] (**) HDA Intel PCH Mic: Applying InputClass "joystick-all"
[ 42.511] (**) HDA Intel PCH Line: Applying InputClass "joystick-all"
[ 42.511] (**) HDA Intel PCH Line Out Front: Applying InputClass "joystick-all"
[ 42.511] (**) HDA Intel PCH Line Out Surround: Applying InputClass "joystick-all"
[ 42.511] (**) HDA Intel PCH Line Out CLFE: Applying InputClass "joystick-all"
[ 42.512] (**) HDA Intel PCH Line Out Side: Applying InputClass "joystick-all"
[ 42.512] (II) No input driver specified, ignoring this device. [ 42.512] (II) This device may have been added with another device file. [ 42.512] (**) HDA Intel PCH Front Headphone: Applying InputClass "joystick-all"
[ 42.512] (**) Logitech USB Receiver: Applying InputClass "evdev keyboard catchall"
[ 42.512] (**) Logitech USB Receiver: Applying InputClass "joystick-all"
[ 42.512] (**) evdev: Logitech USB Receiver: Device: "/dev/input/event11"
[ 42.512] (**) Option "config_info" "udev:/sys/devices/pci0000:00/0000:00:1d.0/usb4/4-1/4-1.2/4-1.2.2/4-1.2.2:1.0/0003:046D:C52B.0001/input/input11/event11"
[ 42.512] (**) Option "xkb_rules" "evdev"
[ 42.512] (**) Option "xkb_model" "pc104"
[ 42.512] (**) Option "xkb_layout" "us"
[ 42.513] (**) Logitech USB Receiver: Applying InputClass "evdev pointer catchall"
[ 42.513] (**) Logitech USB Receiver: Applying InputClass "evdev keyboard catchall"
[ 42.513] (**) Logitech USB Receiver: Applying InputClass "joystick-all"
[ 42.513] (**) evdev: Logitech USB Receiver: Device: "/dev/input/event12"
[ 42.513] (II) evdev: Logitech USB Receiver: Forcing absolute x/y axes to exist. [ 42.513] (**) Option "config_info" "udev:/sys/devices/pci0000:00/0000:00:1d.0/usb4/4-1/4-1.2/4-1.2.2/4-1.2.2:1.1/0003:046D:C52B.0002/input/input12/event12"
[ 42.513] (**) Option "xkb_rules" "evdev"
[ 42.513] (**) Option "xkb_model" "pc104"
[ 42.513] (**) Option "xkb_layout" "us"
[ 42.513] (II) evdev: Logitech USB Receiver: initialized for relative axes. [ 42.513] (WW) evdev: Logitech USB Receiver: ignoring absolute axes. [ 42.513] (II) No input driver specified, ignoring this device. [ 42.513] (II) This device may have been added with another device file. [ 42.514] (**) HD Webcam C525: Applying InputClass "evdev keyboard catchall"
[ 42.514] (**) HD Webcam C525: Applying InputClass "joystick-all"
[ 42.514] (**) evdev: HD Webcam C525: Device: "/dev/input/event13"
[ 42.514] (**) Option "config_info" "udev:/sys/devices/pci0000:00/0000:00:1d.0/usb4/4-1/4-1.7/4-1.7.2/4-1.7.2:1.2/input/input13/event13"
[ 42.514] (**) Option "xkb_rules" "evdev"
[ 42.514] (**) Option "xkb_model" "pc104"
[ 42.514] (**) Option "xkb_layout" "us"
[ 42.514] (**) 3Dconnexion SpaceNavigator: Applying InputClass "joystick-all"
[ 42.514] (II) No input driver specified, ignoring this device. [ 42.514] (II) This device may have been added with another device file. [ 42.515] (**) Key Tronic Keytronic USB Keyboard: Applying InputClass "evdev keyboard catchall"
[ 42.515] (**) Key Tronic Keytronic USB Keyboard: Applying InputClass "joystick-all"
[ 42.515] (**) evdev: Key Tronic Keytronic USB Keyboard: Device: "/dev/input/event14"
[ 42.515] (**) Option "config_info" "udev:/sys/devices/pci0000:00/0000:00:1d.0/usb4/4-1/4-1.7/4-1.7.4/4-1.7.4:1.0/0003:03F9:0100.0005/input/input14/event14"
[ 42.515] (**) Option "xkb_rules" "evdev"
[ 42.515] (**) Option "xkb_model" "pc104"
[ 42.515] (**) Option "xkb_layout" "us"
CTRL-ALT-BACKSPACE (yes, I've enabled it) returns me to a kdm login screen which looks perfectly normal. Logging back in returns me to the pixellated desktop. Alt-Ctrl-F1 gets me to a console, which also works fine. When this happens, nothing appears in dmesg. Nothing appears in /var/log/messages. Nothing appears in the Xorg.0.log other than the notice that the VT switch has happened. The desktop is totally unusable, but the system seems to have no indication of a problem whatsoever. The only fix is a 'shutdown -r now', to reboot the computer, and then the cycle repeats. Consistently. Every 10 days. I've had this system for two years now, running three displays. It only started doing this a little over 6 months ago. I haven't been able to find any bug report / issue quite like it with google. I thought it might be my hardware going bad, so I bought another of the exact same card. I now have two identical cards that both work perfectly for 10 days, and then pixellate. It pixellates in my hot room in the summer, and in my cold room on the dark winter nights. gkrellm sensors report that the video card temperature is lower than the CPU temperature on my quad-core i5. It really points to software. But what? The radeon driver? KDE? Mesa? All of those have now been updated by portage multiple times since the problem began, and the issue remains. Well, it's a new year, and now it's starting to bug me. Any clues where the problem might be? Any idea how to go about debugging this? So it only happens with KDE ? is compositing for kwin enabled ? I assume the pixellation applies to the whole monitor all the time like indicated in your screenshot ? Can you file a bug at https://bugs.freedesktop.org/ ? So far I've only tried it with KDE, as that is my usual desktop, and the only one I have installed at this time. Compositing is enabled, and works fine. In fact I have desktop cube animation enabled with four pager windows, and the system easily rotates the cube around across all three monitors with no problem when switching. No corruption with glxgears or any other OpenGL program I run. Yup, it occurs across all three monitors at the same time. As I move the mouse around the 'pattern' of the pixellation changes, and it appears that mouse and keystrokes are getting to the background as they should (eg I can occasionally see the panel popup appear behind the pixelation if I mouse-click in the right spot.) Naturally, the desktop is unusable when there is so much pixellation. I've thought of doing so, but the fact that this only happens when transitioning between KDM and the KDE desktop has me wondering if this is an X bug or a KDE bug. The 10 day cycle time of this issue also makes debugging it a PITA. I do a portage update every day, so whatever the current stable releases are (on Gentoo) are what I'm running. I've thought about that. Given that the issue has such a slow 'incubation' period, I'd probably have to install the proprietary drivers rather than run off DVD. I've been hesitant to do that since I used to run the fglrx driver a few years back, and quite frankly it's a buggy POS. For what I do I've found the open-source driver to be lower-performing but far more stable in general. You're right though--I may have to revert back just to try to narrow this bug down some. BTW, I didn't mention in my original post that I actually have 3 of the exact same model of this video card. The third card is running in a different system that only has one monitor, and has never exhibited this issue. These are Sapphire 1G DDR3 Radeon HD6450's, with 'Flex' Eyefinity for supporting three DVI monitors. They are fanless video cards running in Shuttle xPC boxes. I'm certainly not discounting the possibility this is a hardware issue caused by the card struggling to drive three monitors. However, like I noted in the original post I haven't seen any untoward temperature readings, either from the onboard sensor or my infrared non-contact thermometer. There's also the fact that this exact system ran fine for 18 months in this configuration before it started displaying this pixellation issue about 6 months ago, and a brand new replacement card has exactly the same symptoms. Nothing special. I'm not a gamer, so I don't use OpenGL for much other than desktop eye-candy. I'm an engineer, so there's a lot of coding, compiling, Eagle PCB layout, and the usual spreadsheet, LibreOffice, Firefox stuff. Nothing that really stresses the video card other than having three monitors running. Thanks for the response. It appears that few Gentoo folks are seeing this. Sounds like my best option at this point is to gather a little more data and then submit a bug report on freedesktop as you recommended. I would recommend trying a different display manager and/or desktop environment to start ruling things out. Well, I made it six days this time. Logged in to KDE, and the screens filled with 1 cm blocks of random patterns--some from the background, some just solid color. Like Aquous mentioned, I had gone ahead and set up XFCE as a second window manager so I could determine whether it was KDE or not. Ctrl-Alt-Backspace out of KDE got me back to KDM, but that screen was now as pixellated as the desktop. Ctrl-Alt-F1 to a VT and browsing the logs showed no errors in either dmesg, /var/log/messages or Xorg.0.log. I tried restarting xdm, but no change. So I stopped xdm, switched to a different VT, and ran startxfce4. I could see XFCE start up and run by watching the changing patterns of the blocks, but it was just as pixellated as KDE was. I browsed the logs again, and still nothing. Ctrl-C'd XFCE, ran it again, same issue, same lack of warnings in the logs. Finally rebooted, and everything returned to normal. So at this point it's really looking like a driver issue. Time to head off to freedesktop.org and see what I can do to start troubleshooting in that department. Other than that, you can also check whether this problem disappears after a suspend-to-disk cycle. I may try some of that during debugging, but I doubt it's a hardware fault (although after 30 years of engineering design, I've seen enough to never say never...) I have three identical cards in my possession, running in two systems. One is on a backup system driving a single monitor and never exhibits this issue. The two systems are nearly identical except for the number of monitors. The other two I cycle through my main workstation with three monitors, and both display the exact same symptoms on that system. I doubt it's heat or stress related, because my temperature monitor shows no issues, and a simple reboot will clear the problem up, typically for a week. These two systems rarely get turned off--they stay up 24/7/365 unless I have to work on them. I would expect a hardware problem like overstress or failing memory to still exhibit symptoms after a short non-power-cycled reboot, but in this case when I reboot the displays resume proper operation and stay that way for days. There are some cards like the Radeon 4870 X2 which had a design defect, which lead to improper cooling of the memory chips on the back side of the PCB. For the 6450 this is less likely, I agree. Something else you can try is "vbetool post" which will re-run the initialization code of your card's video BIOS. This however can confuse the drm, so you may need to disconnect the radeon kernel module from the framebuffer console and then unload the module first. You can turn on debugging on the kernel side with the drm.debug=... parameter (it is a bitfield, a value 15 will turn on everything). VRAM usage and other kinds of GPU utilization can be monitored with the radeontop utitily. Thanks for the pointers chithanh. I just emerged the radeontop tool and took a screenshot. I'll take another in a week or so when the problem re-occurs to see if memory is leaking. I'll also start working on enabling the debug stuff so I can (hopefully) get more data when it happens again. Happened again today, exactly 10 days since the last 'episode'. 10 days ago, radeontop reported 'Graphics pipe' at 0.83% usage, and VRAM at 207M / 1024M, or 20.20%. This while logged in to KDE running in a Konsole window just after a reboot. Today, could not run Konsole as the desktop was unusable (until after reboot). However, running radeontop from a VT reported everything as 0.00% except for VRAM, which was reported as 13.85%. CTRL-ALT-BACKSPACE back to the kdm login screen (also corrupted) dropped VRAM down to 3.03%, with everything else still at 0.00%. So, it does not appear to be a memory leak on the video card. Consistently 10 days. Still. 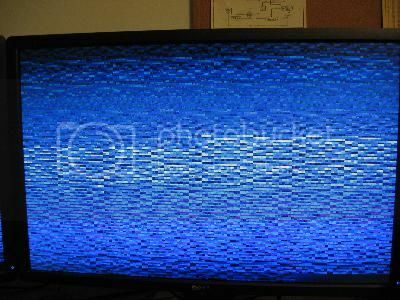 This time when X pixellated when logging in I went to a VT and did 'echo 0x3f > /sys/module/drm/parameters/debug'. That generated reams of debugging output from dmesg when I switched back to X and moved the mouse around. A sample is below. Curiously, though, none of it seems to be all that unusual. [936539.282752] [drm:evergreen_gpu_check_soft_reset] MC busy: 0x00000400, clearing. [936539.782937] [drm:evergreen_gpu_check_soft_reset] MC busy: 0x00000400, clearing. [936541.980110] [drm:radeon_info_ioctl] BACKEND_ENABLED_MASK is si+ only! [936541.980171] [drm:radeon_info_ioctl] tile mode array is si+ only! [936541.980174] [drm:radeon_info_ioctl] macrotile mode array is cik+ only! The above is a truncated log--just a few seconds of screen activity generates many KBytes of dmesg output. The snippets above show the only sections where anything close to error returns or the like seem to be occurring. However, this output doesn't look any different from the output that is generated when everything is working normally. Saving the dmesg output and doing a grep through the whole thing doesn't return any hits on Err* or Warn* or anything that looks like an error message. Strange. I'm beginning to wonder if this is a hardware bug triggered by some driver change a while back, but which the driver doesn't see when it occurs. Next time I'll try vbetool and re-starting the radeon driver. You can increase the dmesg buffer size with the log_buf_len=... kernel parameter, see /usr/src/linux/Documentation/kernel-parameters.txt for details. Or instruct your system logger to log kernel messages. Thinking about it again, it may even be enough to unload and reload radeon without vbetool post.